Dr. John Patience, with his wife and students from Iowa State University. DES MOINES, IOWA – United Animal Health presented Dr. John Patience with the 2017 John B. Swisher Leadership Award on June 7, 2017 at the World Pork Expo in Des Moines, Iowa. 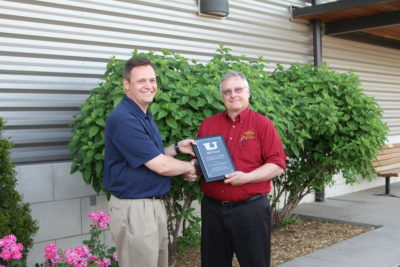 Dr. John Patience (right) accepting the John B. Swisher Leadership Award from Doug Webel, President and CEO of United Animal Health. Dr. Patience, Professor at Iowa State University, is recognized nationally for his leadership in animal agriculture. For the past 9 years, Dr. Patience has worked in the Department of Animal Science at Iowa State. Prior to that, he was the President and Chief Executive Officer of both PSC Elstow Research Farm, Inc and of Prairie Swine Centre, Inc.
His numerous awards and recognitions include the New Frontiers in Animal Nutrition Award from the Federation of Animal Science Societies / American Feed Industry Association, the Animal Industry Service Award from the American Society of Animal Science, the Lifetime Achievement Award from Alberta Pork Congress, and the Award for Excellence in Nutrition and Meat Sciences, from the Canadian Society of Animal Science, to name a few. 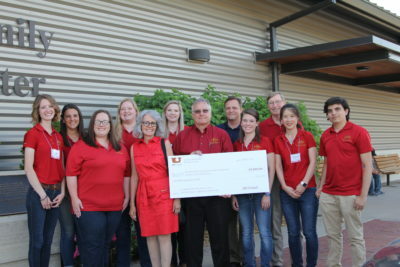 As part of the honor, United Animal Health has contributed $5,000 to the Department of Animal Science at Iowa State University.